Nine years I watched it and dreamed of a new shiny kitchen. While waiting for the money for it we spent money on other things like building sauna (as people in Finland do) and carage. Kitchen could wait, because we had running water right? Whenever I went there the green and white colours on the floor reminded me of the challenges to make it look calm. 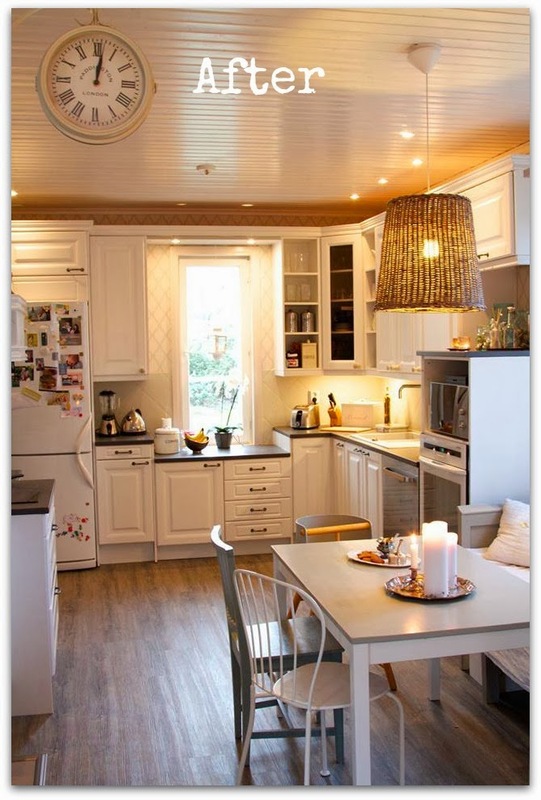 Also the 6 different shades of wood and peach light doors on the cabinets just made me feel sick. 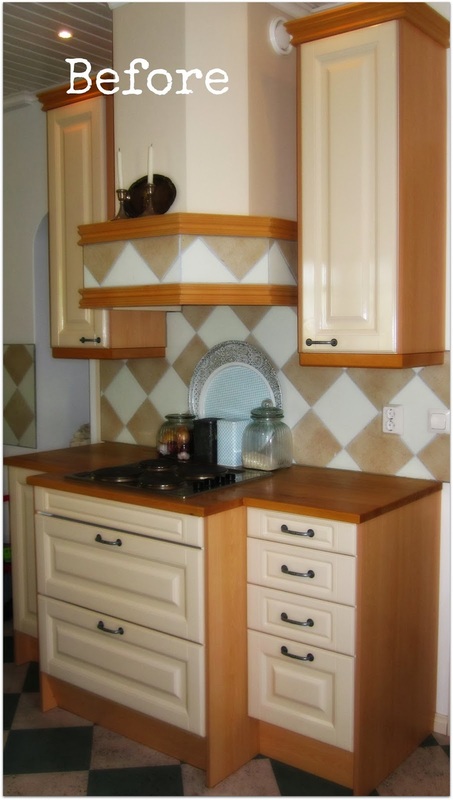 Then I realized, that actually the old kitchen is quite handy, but I just don't like the colours of it. how about some paint on it? What can I loose? It took me almost a month to finnish the whole thing. With 1 year old in the house it is quite a challenge to paint something while they are awake, so of course it took me most of my free time in the evening to do this. Sanding all the surfaces, ripping of the old floor (with my 11 year old) and painting it all over again. Waiting for my wallpaper delivery from UK (with the help of my dear friend living there and husband visiting) to arrive and then having some time to get it on the walls. But I made it! 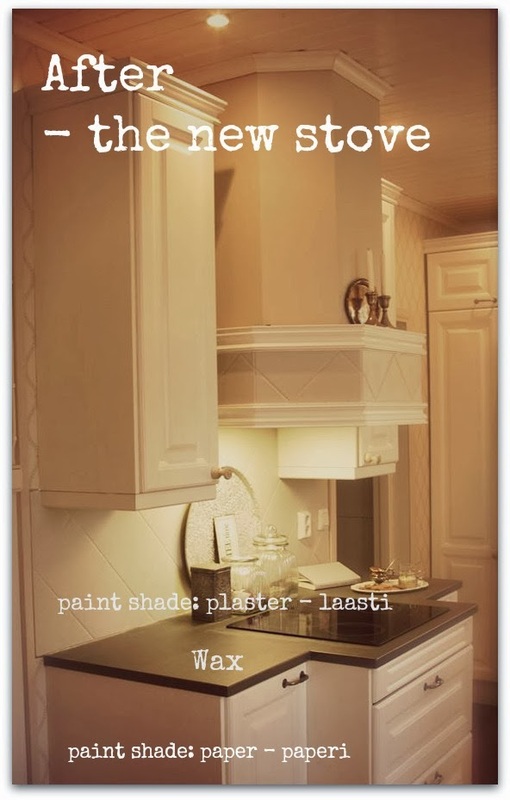 At the same time I changed the sink, tap and the stove to give it a fresh look. See yourself what a difference it all made. The floor material is still the same - cork - even if it looks quite different. It feels really nice under your feet and you can also feel the floor heating through it. The lamp is from Villa Sandra Hyvinkää, which is owned by my friend Heidi. She has really good taste! The kitchen table has followed us 17 years and it is from Ikea. This is the second paint it got on now. The wooden sofa is also old and got a new darker gray paint on. My next drean is an old wooden desk with rusty look. My mom found one from an abandoned farm they bought and it is already waiting me and some serious renovation. So I have something to wait once again! This picture above took also part in Farrow & Ball contest 2014 and got in top 10. While I am writing this, the competition is still on. 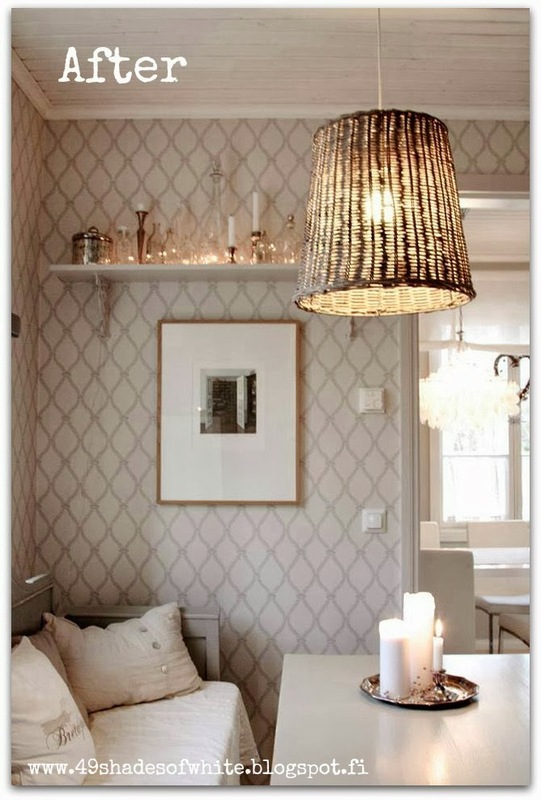 The wallpaper is from Farrow & Ball Crivelli Trellis BP 3102. My friend bought the rolls for me from Oxford Summertown showroom, but afterwoods I found out that there is also a reseller in Finland Helsinki called Kuisti. Service at both showrooms is excellent! 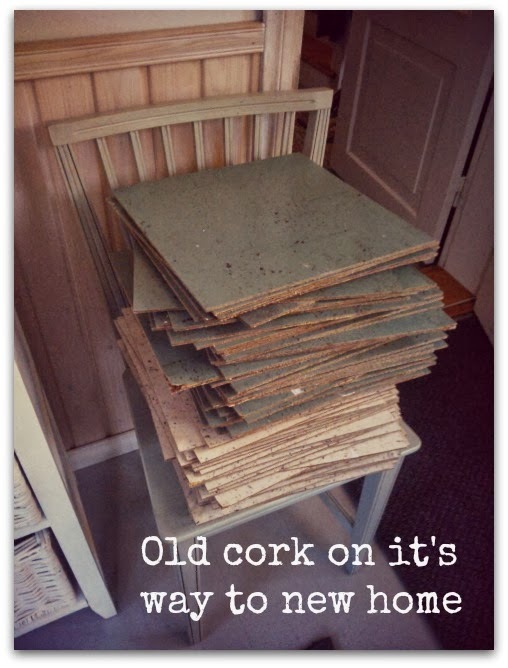 Tip: try and sell the old cork if it is still ok to go and all the other stuff like sink, tap etc too. Mine found a new home through local facebook group that sells used stuff. It is ecological and helps you to get rid of it all easier too.